Tiered wedding cakes come in all shapes and sizes. Tiers are individual graduated cakes most often going from large to small, sitting on top of one another (stacked) or raised with pillars. 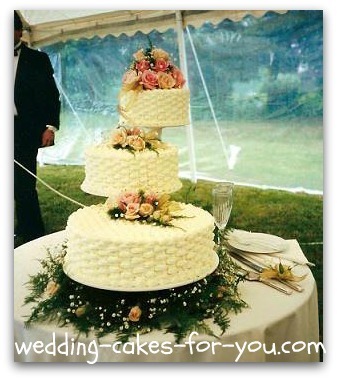 Generally tiered cakes are reserved for weddings, but can be used for all occasions. The wedding cake with fresh flowers below is a lovely example of 5" spiked PUSH in pillars. It looks very much like it is stacked because I filled the spaces with fresh flowers. 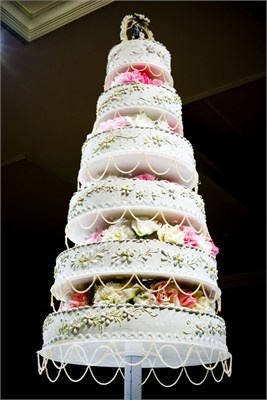 This adds a little extra height and the cake instantly becomes taller and more elegant. 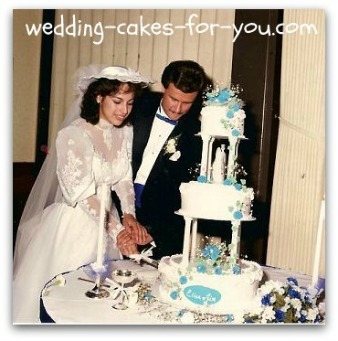 Check out the vintage 1980's traditional wedding cake with butter cream frosting below with 7 inch pillars, and blue wedding cake roses. This was a classic. You don't see them so often anymore. Royal icing roses mounted on wire and real baby's breath decorated the cake. The slender bride and groom topper fit perfectly under the top tier. This is one of the first wedding cakes I made when I had started the "I Do Cakes" business in California. A Floating Cake Stand will help you to achieve this cascading look. 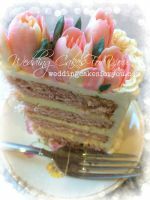 When stacking or tiering cakes make sure they are well balanced for visual appeal. They should either be centered over one another or intentionally off centered, for a whimsical look. For centered cakes I have found that a four inch difference in the sizes of each tier looks the best. But there are no rules. Get creative and experiment with size and placement. The same applies for raising your tiers. 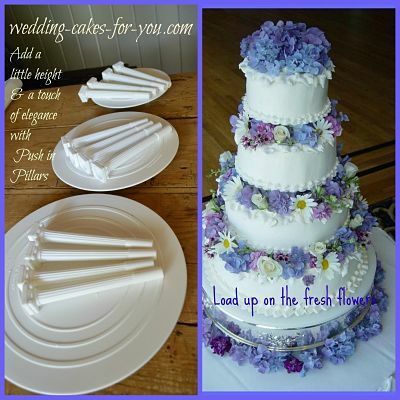 Using pillars to raise the cakes, will change the look and feel instantly. Pillars are nice if you want to add height, but also can add a touch of elegance if done well. These are 5 inch plastic Wilton pillars. Flowers arranged in between the tiers is a nice touch or other decorations can be used such as seashells or sugarpaste flowers. All of your cakes should be on a cake board so that you can lift and move them around. 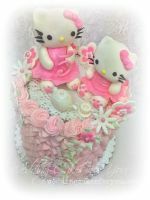 Hot glue between the cardboard rounds and the platter or stand works well to make sure your cakes do not slide during delivery. Each cake should have a support structure so that the weight of the ones above do not crush the ones below. Wooden dowel rods and sometimes plastic straws can be used to support each tier. 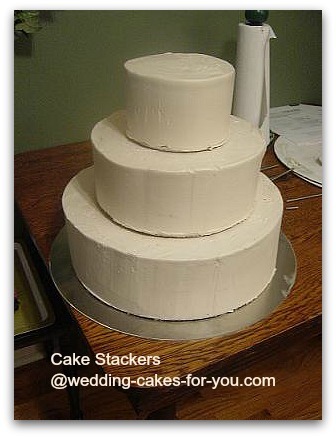 There is a wonderful NEW product called Cake Stackers that I sometimes use for large wedding cakes.If you would like to see my review of the Stackers go here. 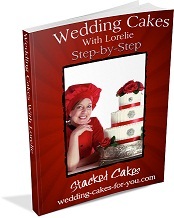 They are designed to center and align your cakes as well as reduce your stress level during transportation. I wish they were available when first starting a business way back in 1985. Take a look at these. You can actually hold a fondant cake upside down and it will stay put. 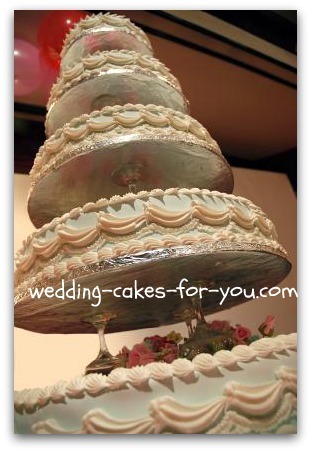 Wedding cakes can be raised using champagne glasses if the cake is not terribly heavy. A light cake recipe probably with no fillings would be appropriate for this. 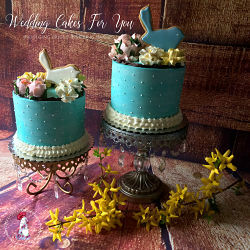 The decoration on the side of the tiered cake is also a very traditional design. 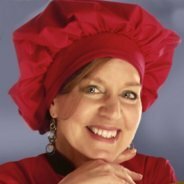 Would you like to start your own business someday or do you just want to do it for fun? 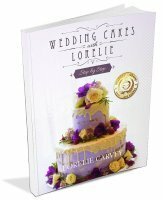 Take a look at Wedding Cakes Step-by-Step with Lorelie. 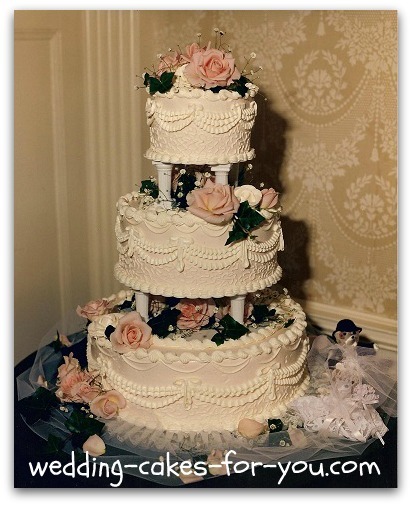 All of your questions will be answered about tiered wedding cakes including safely delivering your precious cargo. 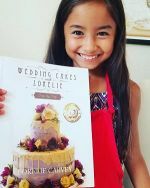 This is a GREAT book for DIY brides too!!! 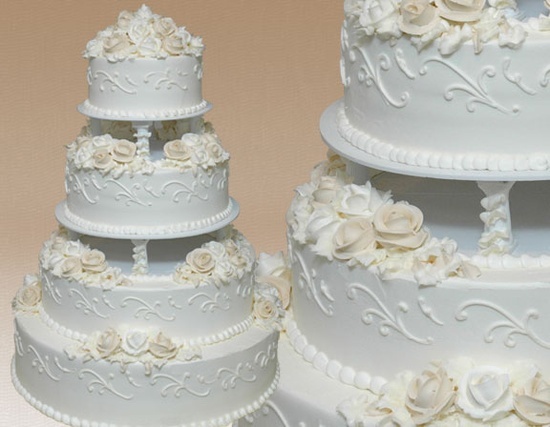 Beautiful traditional tiered wedding cakes from Montilios a bakery in Massachusetts. Center pillared construction. Flowers in between tiers. Stacked right on top of each other. 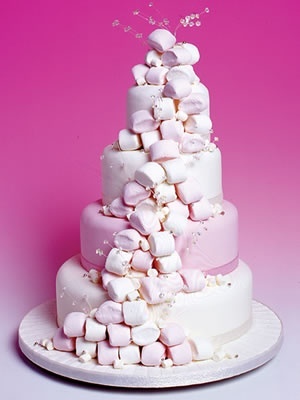 A whimsical marshmallow themed wedding cake. The dowels inside the cakes are what give it support. Thanks for visiting and I hope this website has been useful to you. If you did find something of value here please share it with your friends.